Keep warm while caring for the environment. The amount of CO2 emitted from a piece of firewood that is rotting in the forest roughly equates to the amount of CO2 that is emitted from the same piece of wood when it is burnt. When the forest is fully grown, the trees take up the same amount of CO2 that they emit when they are rotting or being burnt. Therefore, using wood for heat is CO2 neutral and, as opposed to fuelling a fire with oil, gas etc. does not contribute to global warming but instead becomes part of a natural cycle. Strike the pieces of firewood against one another. Dry firewood emits a sharp sound. Wet firewood emits a dull sound. Spit on one end of the firewood, or dip it in soapy water. Blow hard on one end. If the air gets through and the spittle bubbles up, then the firewood is dry. Let it depend on a test: If the firewood burns easily with a clear yellow flame but generates a lot of smoke then it is not dry enough. Generally speaking, there is no species of wood that is better than another when you use a wood-burning stove for heating. Light wood species are both easier to chop and to ignite and are therefore suitable when you fire up. On the other hand, they burn more quickly than the heavy wood species and generate somewhat less heat. Therefore, it makes good sense to combine the light and heavy wood species if you want to fire your stove economically. 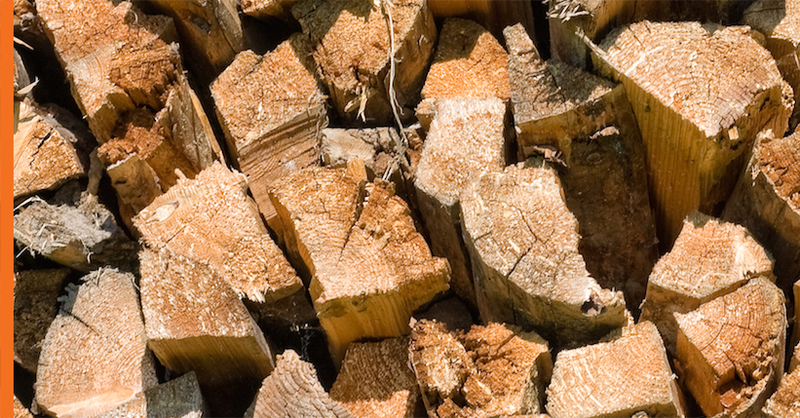 The calorific value in 1 kg of dry wood is 19 megajoules. That is equivalent to roughly a ½ litre of oil. However, in practice, there will always be a little water in the firewood and the efficiency of a wood-burning stove is not as high as an oil-fired stove. As a rule of thumb, with a cubic metre of fuel it is possible to save around 150-200 litres of oil. 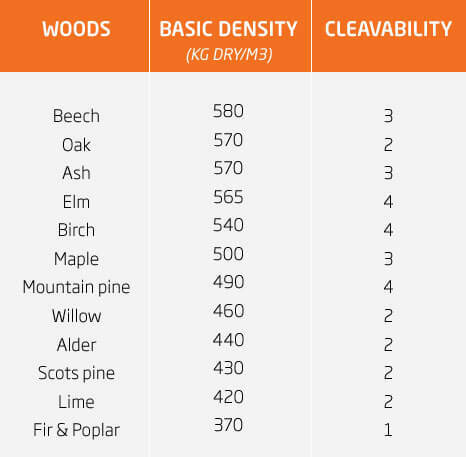 The basic density can vary 10-20% on either side. Cleavability is indicated on a scale where 1 = very easy to chop, 2 = easy to chop, 3 = difficult to chop, 4 = very difficult to chop. 1: The tree is felled before 1 April. 2: Cut and chop the firewood as quickly as possible. By 1 May at the very latest. Chopping the wood helps it to dry out more quickly because water can only evaporate slowly through the bark of the tree. 3: Store the firewood under a porch roof over the summer. In cases of emergency, a tarpaulin can be used. Check the moisture level again before you use it. 4: Preferably move the firewood indoors a week before it is to be used. Thump the pieces of firewood against something hard so that beetles and craneflies are not taken inside along with the wood. Your family and pets will appreciate it. Once in the living room, the water content of the firewood can be brought below the recommended 20%.